The Galloway Arms Hotel is a heritage listed, quality 10 bedroom hotel lying midway between the town centres of Castle Douglas and Dumfries. These towns are 18 miles apart, so that Crocketford over the years became fondly referred to as ‘The Nine Mile Bar’. We are a family owned and managed heritage hotel in the heart of South West Scotland, benefiting from a rural location which is also central. 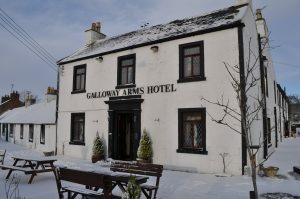 The Galloway Arms has been serving the needs of weary travellers and visitors to the area for more than two hundred years and pride ourselves on delivering service built upon years of tradition and experience. Relax and unwind in the Nine Mile Lounge Bar with one of our premium malt whiskies or choose from our continually growing gin collection. Alternatively, you might like to play a game of pool, darts or dominoes with friends or enjoy the sunshine in our fully enclosed beer garden. Our all day menu is available in the front foyer and bar area from 12noon – 9pm. Dining Room is avaliable for bookings. 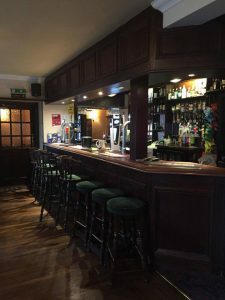 We welcome bookings for all occasions and we can easily accommodate up to 50 people in our Restaurant and alternatively we can hold small weddings and functions in the lounge lounge bar looking out onto the beer garden. 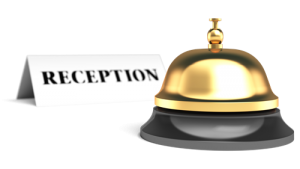 We can offer set menus for a two or three course meal or alternatively offer a good selection on our buffets which can either be a hot or cold buffet.Please contact Paula Brand on 01556690248 who will be happy to discuss any further requirements.